The Graduate Interdisciplinary Program in Genetics at The University of Arizona is an interdisciplinary program whose purpose is to facilitate interdisciplinary training and research in genetics. Graduate students can work toward a Ph.D. or M.S. in Genetics under the guidance of more than 40 faculty members from 10 departments in the Colleges of Science, Agriculture, and Medicine. 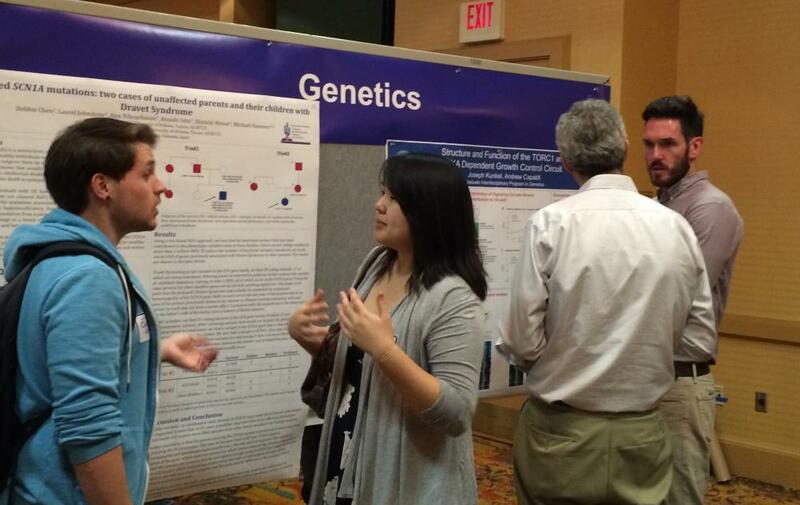 Students in the program can pursue a Ph.D. in Genetics with a specialization in Genomics. They can be supported by fellowships offered by the Genetics Program or by The University of Arizona's new Integrative Graduate Education and Research Traineeship (IGERT) Program Grant for predoctoral study in genomics; see the Genomics IGERT website. The Genetics Graduate Interdisciplinary Program (GIDP) is comprised of an integrated set of graduate-level educational activities, both classroom- and research-based, in the broad discipline of genetics. The Program awards a Ph.D. degree in Genetics and in special circumstances an M.S. degree. Faculty members in the Program have primary appointments across many Colleges at the University of Arizona. The Executive Committee will be appointed by and responsible to the Faculty Director of Graduate Interdisciplinary Programs with the consent of the membership. The Executive Committee serves as the executive, administrative, and policy-making board for the Program. The organization and structure of the Genetics GIDP conforms to the Graduate College policies and to Guidelines of the GIDPs established by the Faculty Director of Graduate Interdisciplinary Programs. In addition to its other functions, the Executive Committee, with the input of all the faculty of the Program, provides the direction and leadership necessary to maintain and foster excellence in the Genetics GIDP’s educational activities. In accordance with this mandate, the Executive Committee will regularly review and evaluate faculty membership, the Genetics GIDP’s educational activities, and any other activities that come under the purvey of this GIDP. These By-Laws constitute the rules that govern the various functions of the Genetics GIDP. I.1. The Executive Committee is responsible for administering the graduate program, including (i) recruitment and admission of students into the Program, (ii) establishment of program curricula, (iii) establishment of requirements for advancing to candidacy and degree completion, (iv) periodic reviews, typically annually, of student progress, (v) promotion of an environment that facilitates scholarly activities in Genetics, (vi) organization of seminars, student colloquia, journal clubs, and other forums for communication of genetics research, (vii) strategic planning for the future development of the Program, (viii) raising and allocating funds for program activities, (ix) review of faculty membership and participation in the GIDP, and (x) reporting the Program’s activities and functions to the faculty and to the Faculty Director of Graduate Interdisciplinary Programs. I.2. The Executive Committee will consist of no less than eight faculty members representing a variety of disciplines across the Genetics GIDP, including departments from multiple colleges currently involved in the Program, and one Genetics GIDP student representative, preferably at the level of Candidacy. Faculty members of the Executive Committee will serve a three-year term. Terms will be staggered so that two members of the Executive Committee rotate off the committee every one or two years. The Faculty Director of Graduate Interdisciplinary Programs will appoint new faculty members onto the Executive Committee with the consent of the membership. Faculty members of the Executive Committee may serve a maximum of three consecutive terms. The outgoing Chairperson will serve a term on the Executive Committee, after the end of his/her term as Chair, as ex-officio (non-voting) member, in an advisory capacity to aid a smooth transition and help the new Chairperson get up to speed with performing Chair duties. Student representatives serve a one-year term and will be elected by the students in the graduate program. I.3. The Executive Committee will sanction the establishment of Standing and Ad-hoc Subcommittees as needed for the administration of the Program as defined in Article I, subsection 1. II.1. The Chairperson of the Executive Committee will also be Chair of the Genetics GIDP. The Chair of the Genetics GIDP, with the advice of the Executive Committee and with the input of the faculty, is granted those powers and responsibilities necessary for a well-functioning program. II.2. Election of the Chairperson. The Dean of the Graduate College, through the Faculty Director of the Graduate Interdisciplinary Programs, will appoint a member of the Executive Committee, nominated with the input from the Genetics faculty, to serve as Chairperson of the Genetics GIDP. Appointment of the Chairperson requires a two-thirds positive vote by Genetics Faculty. A quorum shall constitute one-third of the Genetics faculty members. The Chairperson will serve a five-year term with the possibility of one re-election. II.3. The duties of the Chairperson of the Genetics GIDP are as follows. 3a. With the advice of the Executive Committee, the Chairperson shall appoint Standing Subcommittees to oversee key functions of the GIDP, including student recruitment, student progress, educational curriculum, scholarly engagement (journal clubs, colloquia, etc. ), and submission of appropriate competitive and non-competitive grants. 3b. Call and preside over meetings of the GIDP. iii. meetings of the duly sanctioned Standing Subcommittees as needed. 3c. Administer the Genetics GIDP budget. 3d. Establish qualifying and thesis committees. 3e. Administer curricular activities and execute the educational directives of the Executive Committee. 3f. Administer student academic affairs. 3g. Supervise the Program Coordinator. 3h. Advise the Dean of the Graduate College by way of the Faculty Director of Graduate Interdisciplinary Programs on issues pertinent to the Genetics GIDP. 3i. Report at minimum annually to the faculty members on the state of the Genetics GIDP. III.1. The Genetics GIDP faculty members consist of tenured, tenure-eligible, Clinical-Series and Research-Series faculty at the University of Arizona who participate in research and education in genetics. 2a. Faculty members will be nominated by submitting of a request for membership, consisting of a cover letter and a current curriculum vitae, to the Executive Committee. Criteria for membership shall include interest in participation in graduate teaching and research and demonstrated current scholastic activity in the broad field of genetics. Therefore, the cover letter should include a statement of interest addressing the aforementioned points. 2b. Upon evaluation of the request, the Executive Committee will vote on the nominee. If a nominee receives a two-thirds majority vote, the nomination will be forwarded to the Faculty Director of Graduate Interdisciplinary Programs who shall confer membership. New members are required to present a research seminar in the Genetics Seminar Series within one year of joining the Genetics GIDP Program. Continuation of membership is contingent upon meeting the same criteria at periodic review by the Executive Committee. 2c. A member of the Genetics GIDP will be asked to leave the Program if s/he fails to participate in the activities of the Program. Participation in the Program includes service on a Subcommittee, acting as a dissertation/thesis director for a Genetics GIDP graduate student, teaching a graduate course or seminar in Genetics, or continued scholarly productivity in the general area of genetics. 2d. Members dropped from membership may reapply for membership as outlined in Article III, section 2a. 3a. Tenure track members of the Genetics GIDP may serve as dissertation/thesis advisors for students in the Genetics Graduate Interdisciplinary Program. Research series faculty who wish to supervise a graduate student must request special permission from the Graduate College, Dean’s office (Associate Dean Janet Sturman) through the Genetics GIDP, for permission to mentor a student in the Program. 3b. Members of the Genetics GIDP may be asked to serve on the various Subcommittees of the Program, to participate in teaching, to act as a thesis advisor, to serve on a thesis committee, or to participate in other scholarly activities of the program. 3c. Members serving as major advisors for graduate students in the Program, will be expected to share in the support of graduate students in the Program at a level determined by the Executive Committee. III.4. Voting. Each faculty member of the Genetics GIDP shall have one vote on matters brought to the Program by the Executive Committee. A quorum shall constitute one-third of the faculty membership. III.5. Annual Genetics GIDP surveys will be sent out to monitor the participation and enthusiasm of the faculty. Questions will include what percentage of faculty time is spent involved at any level with the Genetics GIDP and whether faculty still wish to be involved with the Genetics GIDP program. These By-Laws will be reviewed and amended as needed by majority vote of the Executive Committee and approved by a two-thirds vote of the Genetics faculty. A quorum shall constitute one-third of the Genetics faculty.